With the new Verna, Hyundai has a product custom made to tackle its toughest competitors. We drive it to see how it fares against some heady competition. Change, or rather the quest for improvement, as we know, is an ever-evolving process. It’s perhaps even more so in the case of a global conglomerate like Hyundai, where change can be painfully slow and long drawn. However, in the recent past, we’ve seen a resurgence of the Hyundai brand, and more importantly, we’ve seen that the company’s engineers have started focusing on specific areas of their vehicles. Take for instance, the suspension setup of their cars which was a common bugbear for most customers earlier, with the boat-like ride feeling quite uncomfortable on long journeys. And as a result of the soft setup, the handling suffered too. And, of course, there was the steering, which was devoid of any feel whatsoever. But, as change goes, things are changing for the brand, and how. From the Grand i10 onwards, the suspension setup of their cars has improved by leaps and bounds, and with the new Verna, it seems the engineers have now tackled – or are close to – correcting the lifeless steering on their products. To put it in perspective, the new Verna competes in a segment which is full of very worthy competitors with the Honda City and the Maruti Ciaz doing significant sales numbers and still finding favour with buyers. So, the Verna has its task cutout. And it begins its fight with a brand-new design language which it shares with its bigger brother, the Elantra. So, you get the clean lines of the design, along with the large cascade grille at the front, which is now going to be a design highlight for the brand. The large 16-inch wheels lend the Verna good road presence and the LED tail lamps once again are standout items on the rear end of the car. And of particular interest are a couple of new shades on the Verna, with the Fiery Red and the Flame Orange hues being standouts. It’s actually good to see a manufacturer take the gamble and offer some interesting colours rather than the standard White, Silver and Beige colour palette. The interiors too are completely new and share the basic layout with other Hyundai products. So, you get the familiar layout with the center console tilted slightly towards the driver. It features a standard fit 7-inch touchscreen that works really well and is quite sensitive to inputs, as well as featuring decent resolution. Also, the typography and the whole interface is well thought out and is very easy to use. It also features Android Auto, Apple CarPlay and MirrorLink as standard, as well as navigation. With the Arkamys sound system, the audio quality on the Verna is also quite good. However, of more interest, for me at least, and it should be for most of us, are the ventilated front seats, which are a segment first. The air blowing through the seats gives driving in our hot and sultry conditions a much-needed comfort feeling. Another stand out quality of the interiors are the quality levels and the fit-and-finish. In this area, the Verna clearly trumps both the City and the Ciaz by a clear margin. However, if there is a shortcoming to the Verna, it is the space inside the car. While the front seats are nice and comfortable – albeit the passenger seat is mounted a bit high which might limit the headroom for really tall people – the rear seats will be a certain compromise for anyone above six-feet tall. It’s not that its uncomfortable for average size adults – its actually quite pleasing a place to be in – however, if you’re above six-feet, the Verna is a tight fit. And this is where the Verna lags behind its direct competition. On the powertrain side of things, the engines are revised versions of the ones available on the last-generation car, with both the petrol and diesel featuring 1.6-litre power plants. However, the Hyundai engineers have done extensive work on the low-rpm torque delivery of the engines and that is apparent when you drive the cars. In the diesel, there is virtually no turbo lag whatsoever, and from above 1200rpm the engine just revs cleanly, no matter which gear you are in. This makes urban driving a particularly easy task where you can plop the car into third gear and just pootle around town. Of course, this power delivery also means that rather than a pronounced turbo kick or a big top end, the Verna has excellent mid-range which makes driving in both urban and highway conditions a very easy task. The NVH on both the petrol and the diesel is very well controlled, so the engine noise doesn’t seep too much into the cabin, while there is little to no vibration. The Verna now features an option of two gearboxes on both engines – a six-speed manual and a six-speed automatic. Both the gearboxes are very good to use, with the manual offering crisp shifts and well thought out gear ratios. The automatic on the other hand is a huge improvement on the four-speed gearbox of the old car, and is much more pleasing to drive than the Honda City’s CVT ‘box with its rubber band effect. Given the torque and automatic gearbox combination, the Verna in its diesel guise probably would be my car of choice in this lineup. Driving the Verna in both urban and highway conditions over some twist roads as we headed to Athiraplly from Kochi meant that we also got to experience its dynamics to quite an extent. And here the Verna stands clearly well above the last-generation car. The suspension handles both broken roads and high speeds quite well and feels very well tied down. The damping is spot on, and the car is capable of handling broken roads quite well. In fact, the suspension is almost on the verge of being a bit too stiff for Indian conditions and handles the ride and handling compromise very well. And, the new steering is a revelation from Hyundai too. It now has feel and gives you a good idea of what’s happening on the road and how the car is reacting to. It’s not yet perfect and could use a bit finer tuning, but it’s a massive step up from the steering feel of Hyundai’s of old. Of course, being a Hyundai the new Verna also comes packed with new features. 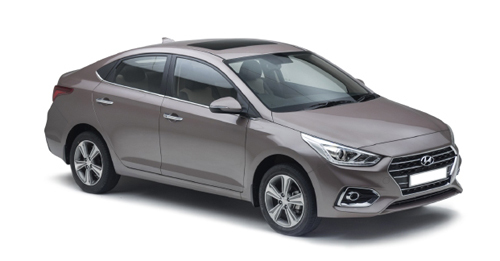 This includes a brand new structure (you can read more about it here: https://www.autox.com/reviews/car-reviews/hyundai-verna-review-first-impressions) which features a lot more ultra-high strength steel and as a result, stiffness. Along with it comes two airbags and ABS as standard on all versions of the car, as well as six airbags on the higher end models. Also, standard are other segment-first features such as the hands-free boot opening which is a bit on the slower side – it takes the car three seconds to recognise you on account of the car in your pocket – but works quite well. An impressive feature for me was the new Hyundai Auto Link which debuts with the Verna. With your car connected to your cellphone via Bluetooth, the app gives you a real-time update on the condition of your car as well as your driving style. Interestingly, it even gives you real time updates on things such as the rpm the car is being driven at, the load on the engine, the fuel level and much much more. Given its potential uses in monitoring the car usage as well as ownership tasks such as booking a service appointment for you, the app is deeply impressive. Change then, obviously, has been great for the Verna. It now features excellent vehicle dynamics, hugely improved steering feel and excellent quality and equipment levels. Pair this with the ease and comfort of owning a Hyundai and the option of manual and automatic gearboxes in both diesel and petrol engines and the new Verna makes for a very enticing package. The only thorn in its side is probably the room available in the rear seat as compared to the competition. So, if that is not a problem for you, the Verna then is currently the best overall competitor in its segment with its combination of quality and equipment levels paired with excellent pricing and good driving dynamics making it a difficult car to defeat.